Allegiance: Wit Studio / Production I.G. Hundreds of years ago, the human race was nearly wiped out by ferocious giants known as titans, which are many stories high with seemingly no intelligence to speak of, and enjoy consuming live humans for fun. From the brinks of extinction, mankind erects a city with tall walls higher then any titan encountered. 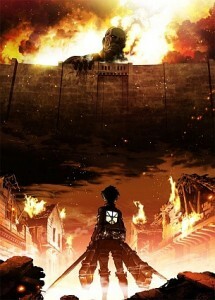 In the present, it has been over one hundred years since the last titan has been sighted, but one fateful day, a young boy Eren Yeager and his foster sister Mikasa Ackerman witness the return of the titans when a super titan appears from thin air and destroys the outer wall of the city. The destruction of the wall paves the way for the titans to invade the outer perimeter and force the humans to run to higher ground behind their next line of defense. All the while Eren and Mikasa witness their mother being eaten alive as they escape. On that day Eren vows to destroy every single titan and avenge mankind.